Chelsea have been struggling to find themselves a Plan B striker to back up Alvaro Morata with manager Antonio Conte clearly not a convinced by Michy Batshuayi. Plenty of people scoffed when it was suggested earlier this week that Andy Carroll could be joining the current Premier League champions, but an ankle injury to the West Ham centre forward has ruled out any possible move this month. 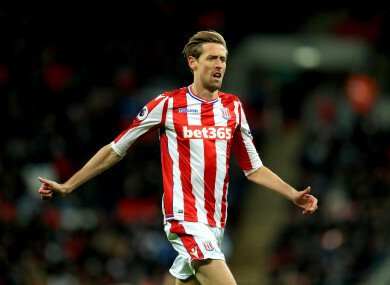 And if you thought those links were barely believable, the Daily Telegraph are reporting that the Blues could now make a shock bid for Stoke City veteran Peter Crouch. The 36-year-old, who holds the record for most headed goals in Premier League history, has clearly been effective down through the years but it would almost certainly represent the most unexpected transfer of the current window. Elsewhere, Sky Sports are reporting that Chelsea will make a €50 million bid for Roma pair Edin Dzeko and Emerson Palmieri. Ex-Man City target man Dzeko would be a far sounder option than Crouch, while 23-year-old Palmieri is a Brazilian-born full-back who switched allegiance to Italy last year. Nice midfielder Jean-Michael Seri has reportedly caught the attention of several Premier League clubs. The 26-year-old Ivorian, who saw a deal to join Barcelona fall through last summer, has a €40m release clause with Manchester United, Liverpool and Chelsea all named as possible suitors by The Mirror. In Germany, Bayern Munich have won the race to sign Schalke midfielder Leon Goretzka on a pre-contract. The 22-year-old German international will arrive in the summer after passing a medical today. After spells in his homeland and the Bundesliga, tough-tackling Stig Tofting joined Big Sam’s Bolton Wanderers from Hamburg for £250,000 in February 2002. Nicknamed ‘The Lawnmower’ for his ability to cover every blade of grass (and, we suggest, his tendency to cut opponents down to size), the Danish midfielder earned a reputation as one of the Premier League’s hard men. That was strengthened when he was jailed for four months in October 2002 after being found guilty of assault. After returning from the World Cup with the Denmark squad, Tofting allegedly attacked the manager of a Copenhagen restaurant on a night out with his team-mates. After serving his sentence, he went on to play in China, but returned to his first professional club AGF. There were also spells with Hacken in Sweden and Danish outfit Randers, before he retired in 2007. Email “Peter Crouch emerges as shock Chelsea target and the transfer window has gone mad”. Feedback on “Peter Crouch emerges as shock Chelsea target and the transfer window has gone mad”.